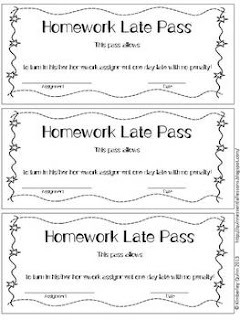 Classroom Freebies Too: Homework Late Pass! Students love homework passes. Teachers not so much. If I give an assignment I give it for a reason. I want the students to complete it because I feel it is a valuable assignment. At the same time I like cheap or free ways to reward my students. That's were the homework late pass comes in. It allows student to pass in an assignment one day late without penalty. My students go crazy over these.